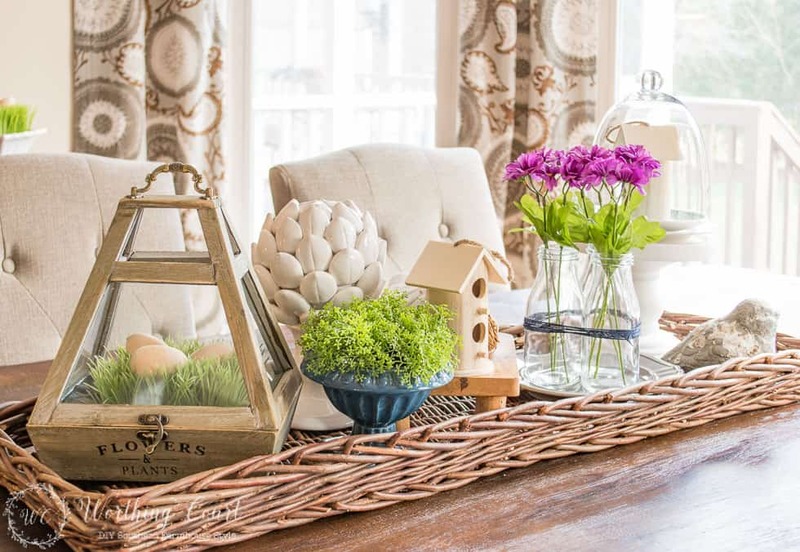 Who knew that lowly jute twine would become such an essential part of farmhouse style home decorating? 😀 I use the stuff everywhere! 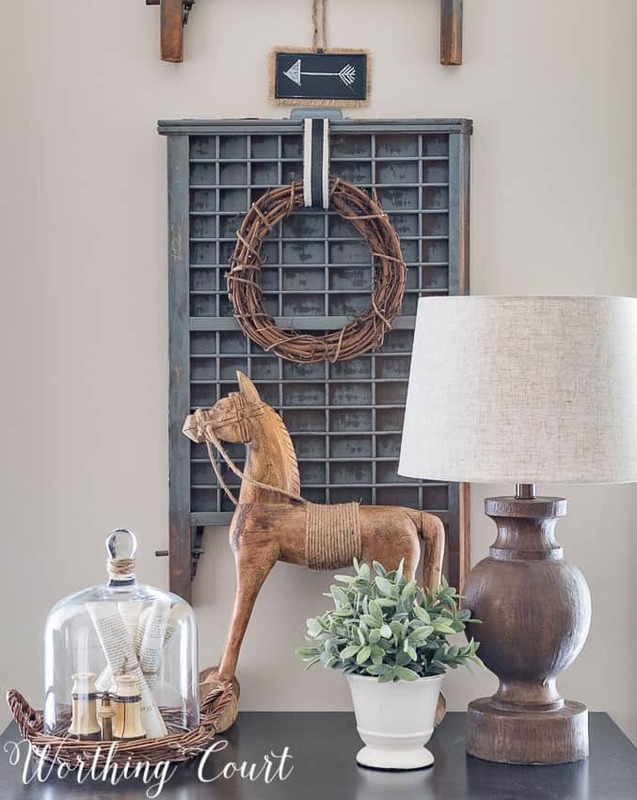 Maybe decorating with twine isn’t as exciting as adding a sliding barn door or adding shiplap to a wall, but in my book, I think it’s the small touches that really bring an overall look together. Click on any post title above the images to see more of the space! One of my very favorite tricks is to wrap jute twine around most anything! Take a look at the twine wrapped around the body of my wooden horse and also wrapped around the knob on top of the plain glass cloche. I even have a piece of twine wrapped around the book pages that are under the cloche. Adding just that one tiny element helps to pull the whole vignette together and to give it that farmhouse vibe that I love so much. I don’t think this little grouping of glass bottles would be nearly as interesting and eye catching if they weren’t tied together with a bit of navy colored twine. It’s different and unexpected! Jute twine has to be one of the least expensive elements that you can use when decorating your home, so I’m very generous with it. 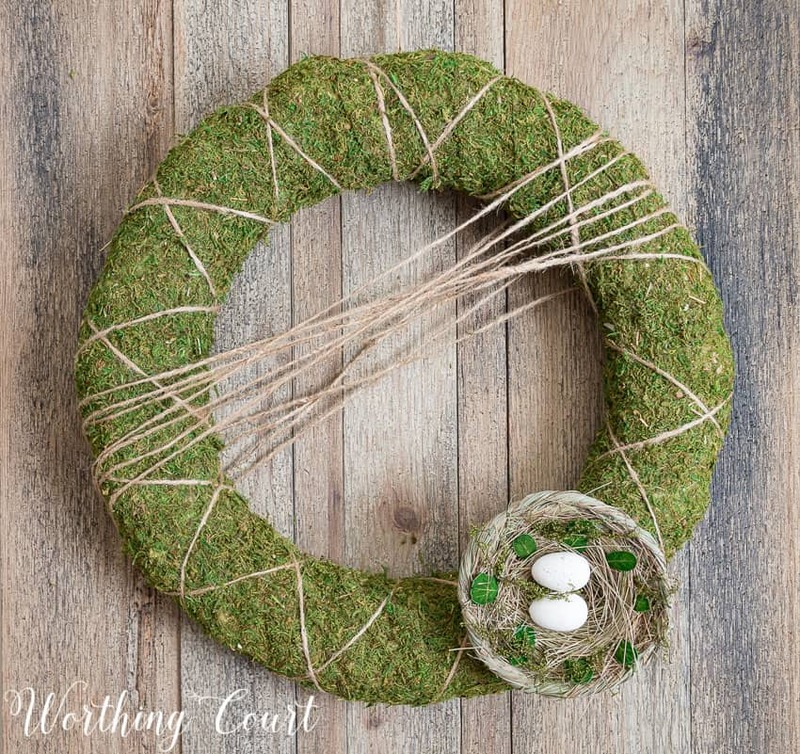 Generously wrapping twine around the moss covered wreath, that’s above this year’s spring mantel, gave it much more presence! Have you jumped on the jute twine bandwagon? What are some of the ways that you use it around your home? Yay! I love it too. I tie a twine bow on the handles of gift bags. Bleh, who needs shiny, poofy poly-junk bows? No really, it comes in so handy! I use twine mostly for hanging objects on the wall, like wreaths, but I can see how wrapping objects, like the horse, or around bottles, makes those items stand out. Great idea, I plan to use more of it. 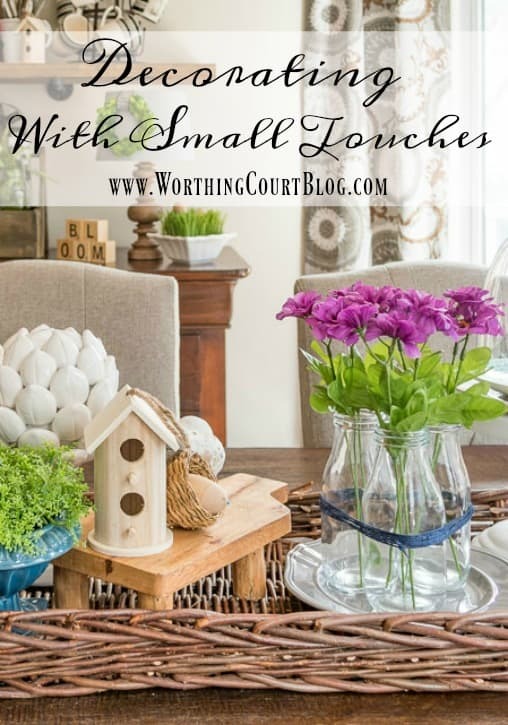 I love that you also focus on the little things that can make the decorating difference! Who knew??? Especially like the colored twine. And, absolutely love your wooden horse!!!! Twine is amazing isn’t it? You illustrated how it can be used subtly but effectively in home decor. I’ve been loving it wrapped on old lampshades where the fabric of the lampshade has been taken off. I recently did it to two of my lampshades and it changed the whole look of the lamp. You really can’t get more bang for your buck. Have a great day Suzy! Your posts are so very creative and you give the simple things new purpose! Keep sharing your wonderful decorating ideas! I have used twine for some things, but not like you have. Wonderful creative brain food! What a great idea. I have places that I could use twine and I am going to try this. Thanks for the inspiration. Moss is my twine! I think we each have that “go to” item that we love that helps complete a look by adding texture and character. 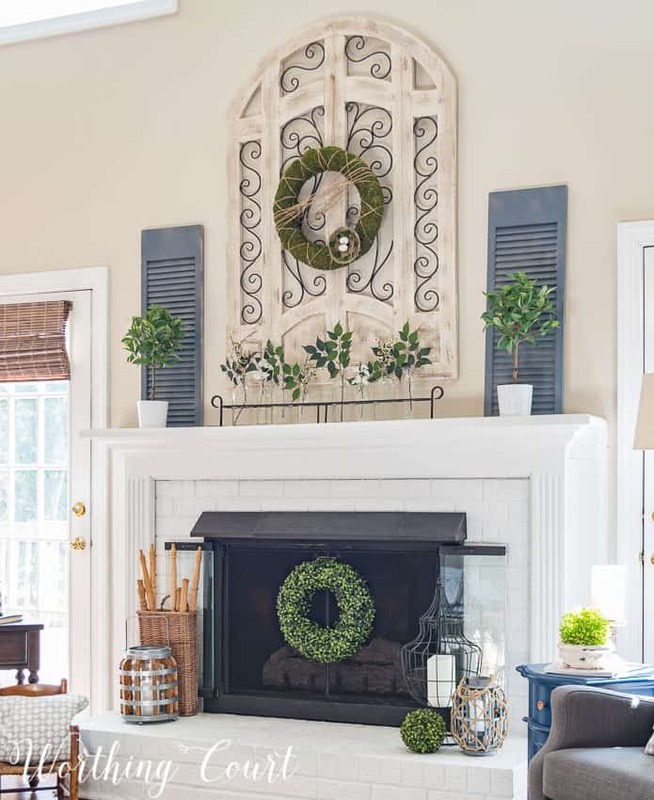 I happen to collect pieces of Lenox giftware, primarily bowls and urns of all sizes, and I like to display them in groupings or add seasonal fillers. Moss is my favorite filler item to use — it beautifully complements the faux bird eggs that are nestled in a small bowl, or helps a collection of unique sea shells to stand out against the various shades of green in a large urn. You’ll have me scouting out various colored twines now, to find some to add texture in other ways around my home! So simple, who knew? Off I go to find some for myself. Thanks for sharing. What a difference small little touches can make. Love your ideas. I bought some of the little bird houses like yours and a small round one too. I love the sweet little addition of them to my spring mantle! Thanks for giving me the greatest ideas? Cute suggestion – I’m already walking around my home with twine in hand! Love your blog and amazing style. Love the inspiration!! Such a easy little touch of added Twine can make such an impact in so many ways! I love how you shared all the different ways a little twine can make a difference! Very effective, that twine stuff. 🙂 *runs to go by all the twines* ! I haven’t used twine for decorating recently, but I always have some and have loved the rustic look of it just on the spool for a long time. I once covered a whole small lampshade with it to give it a new look, though. Wrapped it vertically from top to bottom making sure the strands were close together. The lamp itself had a clear glass base which I filled with sea shells. It turned out to be quite cute. Wonder whatever happened to that lamp! That little project happened a loooong time ago! Guess I better get on the band-wagon and start playing around with twine again! Thanks for reminding me that twine can be quite decorative. On the look out now for colored twine. 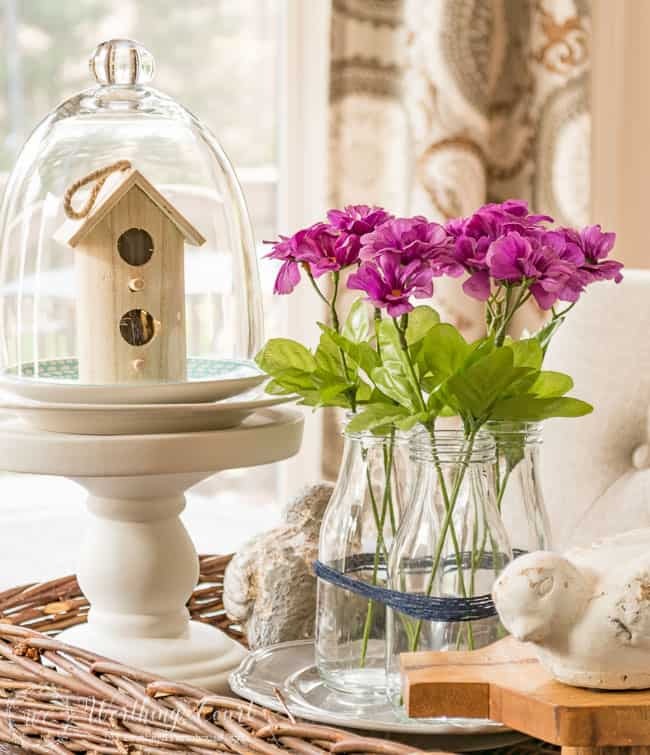 Love your vignettes, pretty cloche with the little twine accent. Just great Suzy. Again, so inspired by your lovely spaces! I’ve been meaning to buy me a ball of twine. Thank you for the great suggestions on how to use it. looks great! where did you find the horse? I have been ooking all over for one! Hi Debbie. I found the horse at HomeGoods, right before this past Christmas. I love your vignettes w/ all the “things”. I have too many things which just don’t look cohesive & interesting like yours. Thank you for the reminder to look at the details. I love your use of twine. I enjoy your blog very much and am always inspired by your style and ideas. Thank you for the inspiration!! Love your style. Like you, I’m a twine kinda girl! This is the way I love to decorate.